Everybody used to make devilled eggs for all occasions some time during the past century. Not so for us. We still make them and still love them and whenever we offer some, at most one is left over if nobody dares take the last one. Otherwise none. Hard-boil half a dozen of medium-size free range eggs, then shock in very cold water and peel. Cut right through the middle, arrange the egg white halves on a serving plate and collect the yolks in a small mixing bowl. Add the devil in the form of a very generous amount of mustard, and perhaps a small amount of soured cream to make the mix lighter. Mix well with a fork or a hand mixer, fill into a piping bag and into the waiting egg whites. Optionally decorate with a caper or a sliver of red peppers, although I find this is taking the retro look too far. For a more refined look and for far more fiddly preparations consider using Quail eggs. This is not so much a precise recipe than a concept, a base for improvisation. I expect that no two of these game terrine will ever be the same, but they will all be rather nice as a starter, or as a light lunch with fresh bread and a light salad. I use 200 g each of venison leg, duck breast and fatty minced pork, and 100 g butter. The pork is already minced, so I chop the venison into coarse mince and cut the duck breast into strips after taking the skin off just so that I get a variety in texture rather than a smooth blend throughout. Put into a mixing bowl, and add on beaten egg, one tablespoon of breadcrumbs, optionally two tablespoons Brandy. A handful of chopped dried Apricots, a handful of toasted pistachio nuts, Macadamia nuts or pumpkin seeds. I season this with a tablespoon each of fennel seeds, allspice and sea salt, all finely ground. Mix thoroughly and let rest for a while. Meanwhile, I crisp rashers of bacon enough to line the terrine tray. Baking parchment comes first, then the crisped Bacon, then the meat mix. Pack this firmly to minimise trapped air, cover with the folded over baking parchment and bake at 160 C for 60 minutes. Let cool down completely before opening the terrine. Well, I say millefeuille but really we are talking about three sheets of double-layered filo pastry, but it does make for an excellent starter! It’s impressive, it has the Wow! factor, and it isn’t all that hard to make. A great way to start a dinner party. My Goats Cheese Millefeuille is a small stack of double-layered filo pastry, flavoured with fennel pollen and baked crisp. In between the sheets is an assortment of textures and flavours such as molten goats cheese, roasted beetroot, raw fennel shavings, raspberries and blueberries. The exact choice of incredients for the filling isn’t very important so long as they combine well and offer variety in texture and aroma. Goats cheese is required unless you change the name of the dish. I usually use the types which are rolled in ash, and melt them in a frying pan with a spot of butter. Roasted beetroot, lightly tossed with balsamic vinegar, a small splash of lime juice and a sprinkling of salt works beautifully. Soured cream will provide moisture, or perhaps a spoonful of roasted fennel puree, the Missus’ favourite. Raw fennel shavings are always nice and, speaking of shavings, Parmesan cheese shavings could also work well. A fruit component is, in my opinion, essential. Fresh raspberries, blueberries or blackberries work well and look great. Blood orange or grapefruit fillets could also work if your citrus fruit filleting skills are OK; the fruit can’t be soggy or it ruins the filo. Buy a pack of good quality filo sheets. Prefer the not frozen variety if you can. Roll out one, and cover generously with melted butter (warm, not hot!). Give it a generous sprinkling of fennel pollen, then add another sheet of filo pastry. Not everyone has fennel pollen in the spice cupboard (and it is a little bit on the expensive side unless you are foraging). Alternatively, course black pepper or fresh nutmeg shavings also work well. Cut the double-layer into the required size, maybe as large as a playing card, using a pair of scissors. Place on baking parchment, then bake at 190 C until dark golden, approximately 10 minutes. Take out of the oven, very gently transfer onto a cooling rack and leave there until it is time to assemble. Use the pictures and your own imagination as a guide! Something with bacon and peas, cheese and pasta, we thought might just do the trick on this chilly November evening. Monica Galetti showed her Agnolotti on Masterchef The Professionals the previous evening and we were thus inspired, but failed to take up her 15 minute challenge. This is abote Agnolotti, or Ravioli, or any other shape of filled fresh pasta, filled with a cheesy cream, served with crisp bacon and peas – almost like a Carbonara, but not including the raw egg yolks given the richness of the pasta filling. Prepare a medium thick roux: Melt a heaped tablespoon of butter, then sweat a heaped tablespoon of plain white flour until the flour is cooked, then add hot milk, stirring vigorously and simmering gently all the time. Then add a good amount of grated Gruyere cheese, a pinch of salt, a large pinch of black pepper and a little ground nutmeg. Let the sauce cool down, perhaps even in the fridge. Roll the pasta to a fairly thin sheet, then pipe a strip of the filling, fold over and form little ravioli pasta. Monica’s method was to pipe a strip of filling, then squeezing the separation. I used the handle of a cooking spoon, which I could roll a little to either side gentry to push back the filling, then push down to seal the pasta. I thought that worked pretty well. Poach in not not quite boiling salted water for a few minutes, taking care that the pasta doesn’t stick to the pan bottom. Fry strips of smoked bacon until crisp, add mushrooms and peas, butter and white wine. Season to taste with salt and black pepper. Gently toss the pasta with the sauce, serve and enjoy. This is a scrumptious goats’ cheese tarte, which makes for a great vegetarian lunch or supper. Gremolata-coated goats’ cheese cubes, topped with honey and orange glazed shallots, beetroot and creme fraice, baked on a sheet of ready-rolled puff pastry. Looks delicision, tasts delicious, what’s not to like? Spread out the puff pastry sheet, then use a knife to mark a one inch border around the edges. All your toppings stay within that inner square: spread the coated goats cheese, add the beetroot dice, add an occasional half teaspoon of creme fraiche. Put the caramelized onions on top and drizzle a small amount of the onion’s cooking licquor across. Eat while warm, but note that everything on this tarte retains heat pretty well. You’ve been warned! Here’s an all-time favourite. It’s Tarte Flambé to the French, Flammkuchen to us, and not very well known outside the southwestern Germany and northeastern French areas. But everyone loves it! A very thin and crispy lean bread base with a sour cream, onion and bacon topping. Seriously, what’s not to like? Pre-heat to oven to as much as you can. Check the baking parchment for the maximum temperature (mine does 240 C), don’t go too much over as it might catch fire and generally gets brittle and of little use when overheating. Prepare one tarte at a time, as you don’t want them to get soggy while waiting for the baking. Spread the spiced soured cream evenly across the base, sprinkly bacon and onions evenly across, then bake until the edges are almost burnt (a few minutes). Here’s a somewhat more detailed and not entirely serious version of the recipe for dummies. Spanakopita is a Greek spinach tarte. 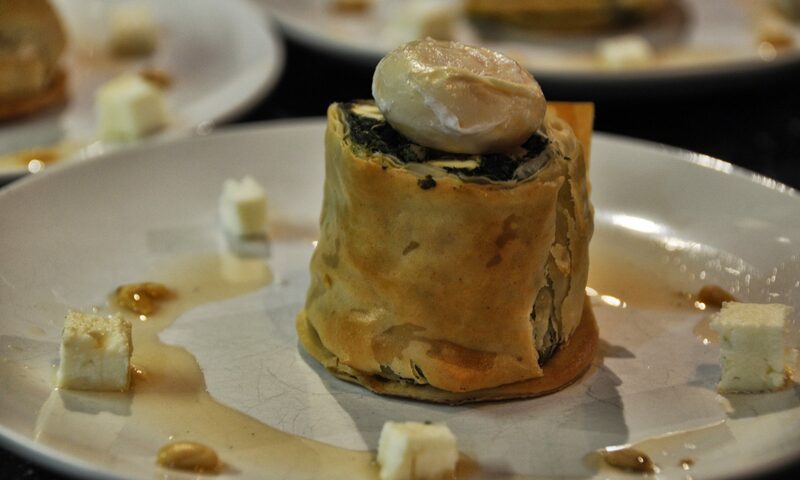 This is a slightly up-market version: instead of a flat tarte with a varying degree of density, soggyness and puffyness, our open Spanakopita is baked as a stand-up roll of filo pastry with the traditional spanakopita filling of spinach, feta cheese and pine kernels. This makes a generous lunch for two, or a delightful starter for four. Begin by thawing the spinach, then squeeze it as dry as you can. Mix it with a handful of flat parsley, chopped, a handful of breadcrumbs, 2 whole eggs. Optionally also add 2 heaped tablespoons of yoghurt. If you can’t find strained yoghurt, strain it with a sheet of muslin. Mix this well, best using the hands. For the filo, prepare 75g slightly salted soft butter. Spread out one sheet of filo pastry, brush with soft butter. Optionally, thinly sprinkle some ground almonds across the sheet, then cover with the next sheet. Repeat this process to get three of four filo sheets combined in this manner. Crumble the feta cheese and distribute evenly across the filo pastry. Sprinkle with the toasted pine kernels, then add the spinach mix (strain if too wet!) to form an even layer. Now roll the flat cake into a roll, and glue the ends together with buttered filo. Wrap with a sheet of baking parchement if necessary, then cut into thick slices. Use the remaining filo to make a little bottom for each slice. Bake at 190C for approximately 20 minutes. Decorate with a poached quails egg, or edible flowers. This is based on a recipe published by Michel Roux Jr. It takes some time to make. We think it’s worth the extra effort, but not everyone may agree. The idea is to serve a little crumbly tarte with a side salad. The tarte is filled with a Red Snapper Mousse and chunks of poached Mackerel, topped with a Tomato Fondue, and served with a Dill sauce. There are quite a few steps here, but none of the steps is particularly difficult, some can be done earlier, and there’s enough to do for two and a nice social cooking affair. The steps are: make a solid vegetable stock. Poach the mackerels. Prepare the shortcrust pastry. Prepare the tomato fondue. Pre-bake the tarts. Make the fish mousse. Make the dill sauce. Assemble and bake the tarts. Prepare the plates cold with a side salad. Serve the works with a slice of white bread and a glass of wine. The amounts in the following produce four tarts, one per diner. Make a savory Champagne Zabaglione, sear scallops. Dress the scallops with a spoon or two of Zabaglione and whack under the grill until the Zabaglione begins to brown. Monica’s candidates had to do it in 10 minutes. You may take longer, but it is actually pretty quick to make. Pre-heat the grill at full whack. For the Zabaglione, whisk one egg yolk per portion in a Bairne Marie. Whisk, whisk and whisk. Never stop, never slow. You’d want the yolks to heat while whisking them white and fluffy. When you’ve reached 60C, begin slowly adding Champage, about 70ml per portion. Season to taste with a sprinkle of salt, possibly a small dash of lime juice. Monica used fresh horseraddish shavings, which we found nice. Black pepper would also work. Keep whisking until you’ve reached the consistency of runny custard, and put in the fridge for a few minutes while you sear the scallops in a black pepper butter. Take a nice wide-rimmed soup plate, add two or three scallops into each, and dress with two large spoons of the Zabaglione. Grill for a minute or two, just until it begins to brown. Decorate with some samphire or a little fresh dill, serve and enjoy with fresh baquette.